Shaan-Kaya is situated in Alupka region. It isn't part of the Main ridge, but is moved forward to the sea, before Alupka wall. Wall difference is about 250 m. In its central part the wall overhangs. It has 6 routes (Note: on December 2001 there were 8 routes passed), all 6 grade. To reach Shaan-Kaya you need to drive to the bus stop “Alupka pitomnik” and go upwards along the road, then through the vineyards. Water spring is in 15 minutes from the wall. “Zenit” route was passed in 1968. It goes by the center of the wall. It is a bolt line which goes to the peak through 120-degree overhang. The route crosses several areas of unsafe rocks. The route is objective danger, but in the meantime it doesn't require any technical skills, as well as climbing skills. I won't define its grade. Rest of the routes is much to the left or to the right from the center. Left routes are more destroyed. On Grishenko route the lower part is rather monotonous – bad bolts, mainly AID. The upper section is more solid and has fewer bolts. There is no information about the left route. Goes along the right side of the wall. The route is mostly by cracks, with much free climbing. Time is 5-6 hours. The route starts from a big tree growing near the wall. First meters are by the tree, then by the bolt line, sometimes climbing, to the ledge. Then go upwards along the crack (nuts, friends), turning into a corner. Belay is on the ledge (bolts). Through the corner go to the left and upwards to the small overhang. Then, through the overhang, go to the right and upwards, through the corners and cracks, bypassing on the right a small cornice, and go to the inclined area. 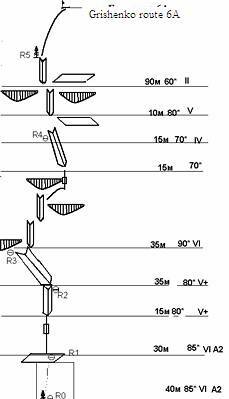 (35m, VI, A2, 90°) , then by simple rocks (15m, III, 70°) go upwards. From the belay go upwards through the destroyed rocks (25m, V, 80°) , then by simple rocks to the big pine-tree (30m, II, 60°) . (№1) Goes about 100 m to the right from Grishenko route. Time is 6-8 hours. 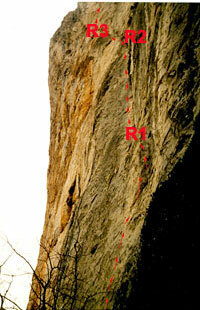 R0-R1 (35m, V-, 70°) Go through the cracks and corners by free climbing and then to the ledge. Then go upwards and to the left along the cracks, free climbing, sometimes AID, to the big cornice. R2 Is on the inclined ledge before overhang. Go upwards along the overhanging crack to the cornice which is passed in the right part. After the cornice by difficult climbing (5m, VI, 90°) , go to the crack and along it, then along the corner, go to the ledge. (25m, V+, 80°) . Then by simple rocks go to the peak. There is no information, but it looks very abrupt, may be, it's one of the most difficult in Crimea . Start is more to the left from Grishenko route, near ivy bush. 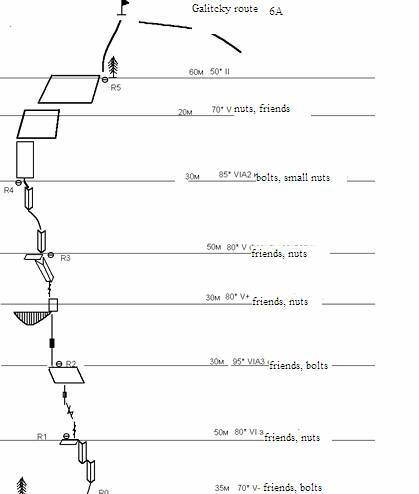 Go to the giant overhanging corner (4-th pitch). After the corner it connects Grishenko route. The routes of Shaan-Kaya are difficult and beautiful, I recommend them to all the ascenders. 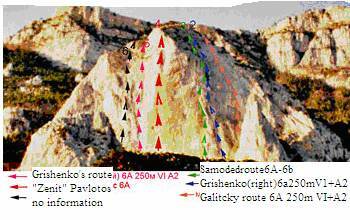 In Ukrainian classifier the routes of Galitcky and Grishenko (right one) are estimated as 5B, but it is a definite mistake. 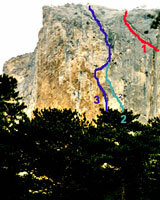 As for the length and complexity of the crux sections they aren't worse than Morcheka, though they are shorter (about 250 m).